Evernote continues to amaze me with their focus on keeping abreast of current technology and continuing to improve my productivity. 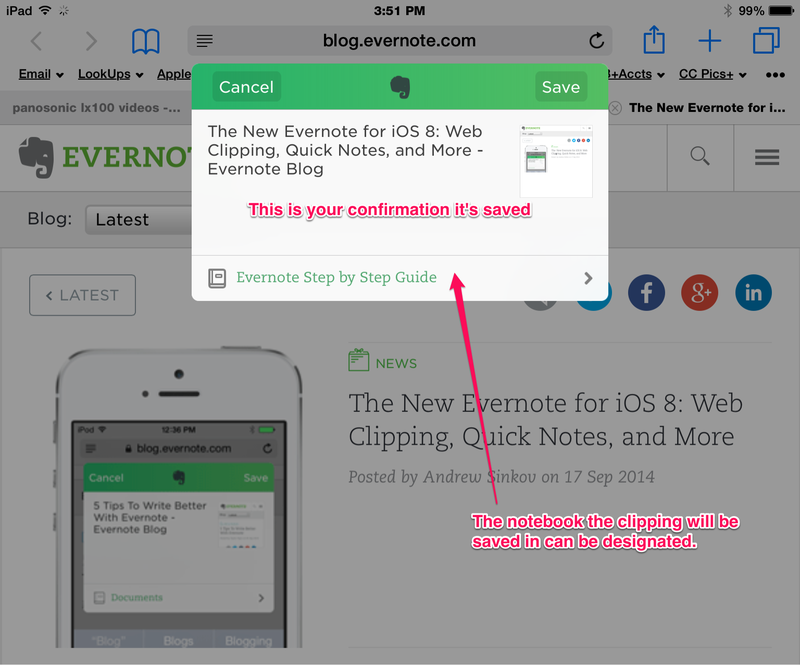 This new feature allows you to use Apple&apos;s &apos;share&apos; icon (normally used to bookmark or email a link), to &apos;clip&apos; a webpage and save it as a note in Evernote. To use the new &apos;Share Extension&apos; you just need to be in Safari and on a webpage that you&apos;d like to clip. Tap the &apos;share&apos; icon and you&apos;ll see two lines of options. The first line shows colored icons for apps you use that Apple &apos;pre-enabled&apos;, such as for messages, Twitter, emails etc. The second line show&apos;s grey scale icons for Safari specific functions such as bookmark, copy, add to Reading list etc. On the top line, if you tap &apos;more…&apos; Safari&apos; will open a dialog box showing apps you have that you can add to the &apos;share&apos; feature. 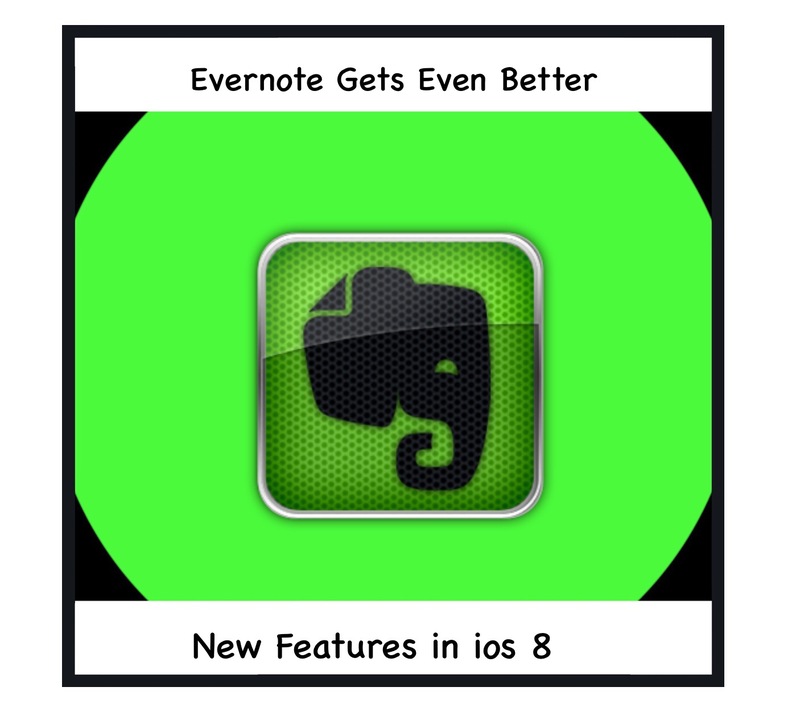 Just scroll down to Evernote and tap the button to the right of it so it&apos;s turned on (green). 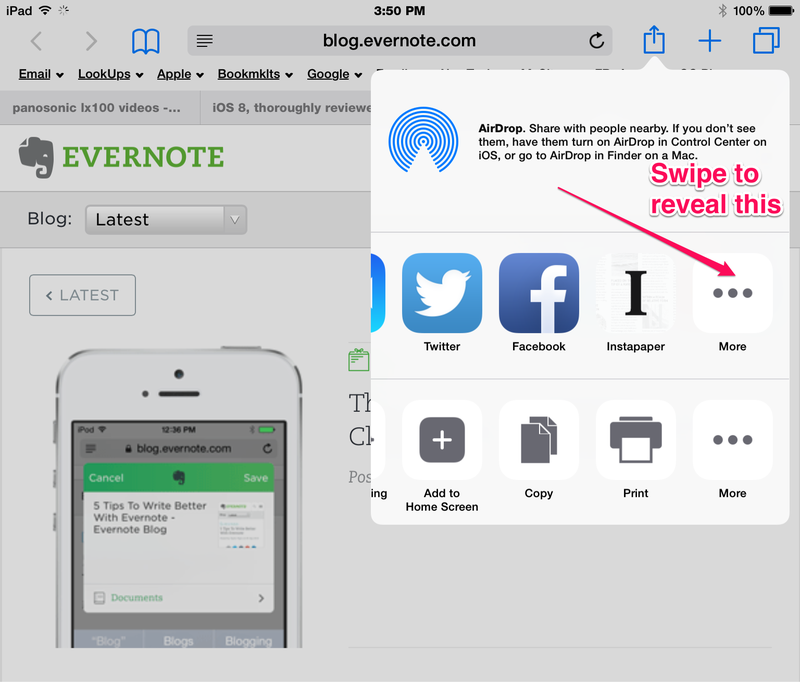 Then when you want to save a web clipping to Evernote, just tap on the Share icon and swipe to find the Evernote icon and tap on it. A little dialog box will pop up at the top of the webpage. Swipe down from the top of any screen to pull down the notifications overlay. Tap on &apos;Today&apos; on the top menu, and swipe to the bottom of the pages. Tap &apos;edit&apos; and look in the 2nd section or block of apps under &apos;Do Not Include&apos;. 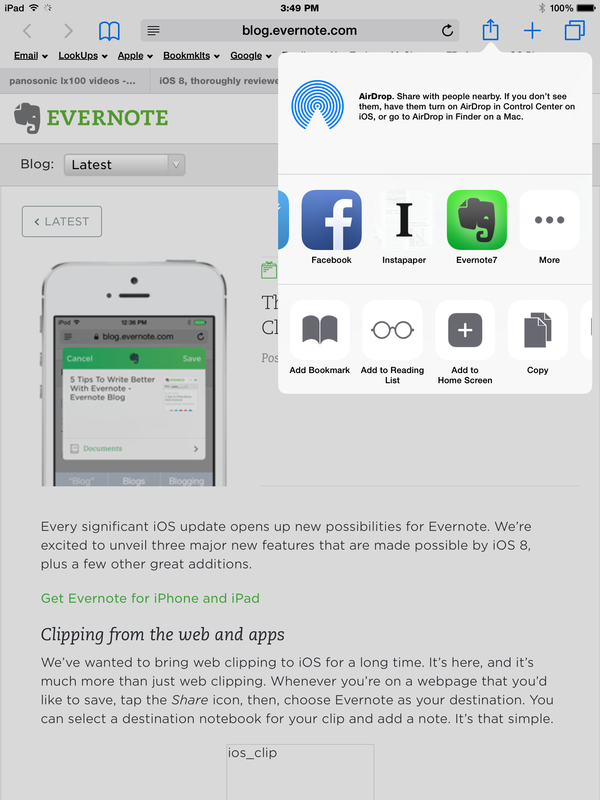 Look for Evernote and tap on it…it will more to the top list. This top list includes all the apps you can access from the notifications function now, so you may want to review adding others if you haven&apos;t yet discovered this feature! Here&apos;s another view of it on an iPhone screen. 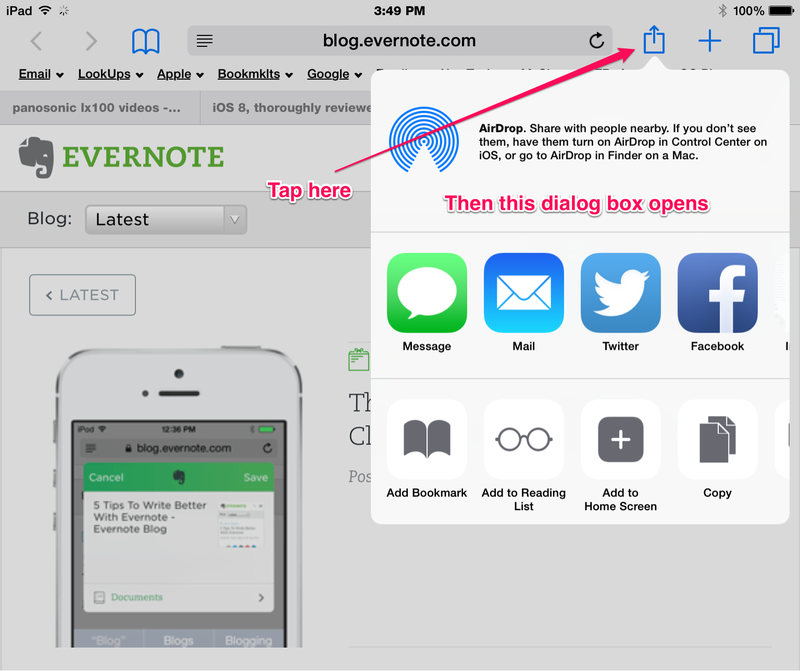 Here&apos;s a link to the Evernote blog telling you more about these two new features. The share sheet extension is great, pity that it doesn’t stay where I put it relative to other options – ie top of the list! This is an issue with iOS though and not Evernote as it happens across other apps too.